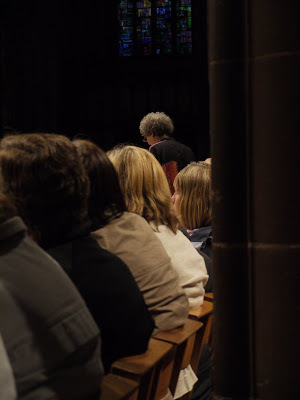 Here is a shot of Margaret Atwood reading in Manchester cathedral last week. It was not the ideal venue and, like most of the audience, I only managed to get a glimpse of the author. However, I am pleased with this photograph (which I obtained in my usual fashion - pointing vaguely in the right direction and hoping). Excellent photo considering how you described the venue to me. Great achievement! Thanks CFR! Atmospheric, if nothing else, I thought. Thanks for posting a photo of Atwood and her talk! Must have been a very exciting experience! My pleasure, Paul. Thank you!